This is a new printing on sturdy acid-free paper. 20 pages. All markings are original. We include photos, a capsule biography, and a listing of his music. Highest quality guaranteed. Size of music is 9.5" x 12.5". $12.00. Bonaventura Somma (1893–1960) was born in Italy, studied at the Conservatory of Santa Cecilia with Stanislaus Folchi, Ottorino Respighi, and Remigio Renzi, to whom this piece was dedicated. He served as music director of the Shrine of the Blessed Virgin of the Rosary in Pompeii and later at the Academy of Santa Cecilia in Rome. For 34 years, from 1926 until his death, he served as organist and music director of San Luigi dei Francesi in Rome. In 1939, he began teaching at his alma mater, the Conservatory of Santa Cecilia, as Chair of Composition of Vocal Polyphony. He served as Artistic Director for Music of the Olympic Games that were held in Rome in 1960; hear some of his music in this video. A few weeks after their conclusion, Somma died on October 23. 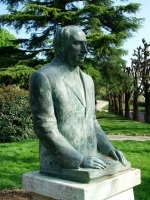 His friends, students, and citizens of Chianciano Terme erected a bronze bust of him. Toccata was first published in 1934 in Nova et Vetera, a theological journal published in Switzerland. This restoration is made from the reissue of 1954 by Casimiri-Capra in Rome. Moderate.